Iriomote Island is situated in latitude 24 degrees 15~25 minutes north, 123 degrees 40~55 minutes of east longitude, locating in the East China Sea. It forms Yaeyama Islands with Ishigaki, Taketomi, Kohama and Kuro Islands. Distance from Iriomote to Taiwan is about 200km, also to the tropic of cancer is only 100km, Taiwan is much nearer than Okinawa Island. Latitudinally, it is more southern than Taipei City in Taiwan. Although there is one hour difference between Taiwan and Japan (Taiwan is later), the standard time of Japan is used in Iriomote which is located next to Taiwan. Therefore there can be about one hour difference between Iriomote and Japanese main islands. This "time difference" can not be a very much hindrance for tourists, however, sunset time is quite late particularly in summer time, we are surprised at twilight brightness at about 8 o'clock PM around the summer solstice. In contrast, sunrise is late, it is pitch-dark at 6 o'clock AM. The total area of Iriomote Island is 284km2 and the circumference is 130km, it is the secondly largest island in Okinawa Prefecture next to Okinawa Island. 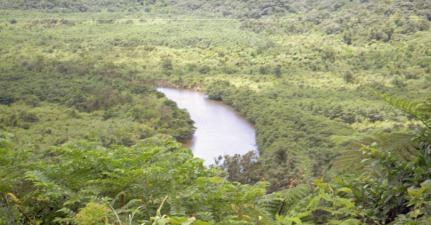 The island contains of many mountains and includes a little of level ground, more than 90% of the total area is covered with subtropical primeval jungle. However, there are not extremely high mountains, even the highest one of Mt. Komi is 470m above, there being some other 400m class mountains. The mountains overlap and their ridges range one another, it makes a complicated topography. Most of the primeval jungle is national forest, being designated as Iriomote national park, animals and plants are protected by supervision of a district forestry office. There is some level ground around estuaries of large rivers and shorelines, being utilized as residential area, farming area and pastures. Rivers well develop because of the complicated topography and much rain, there are many rivers such as Urauchi River, which is the largest one in Okinawa Prefecture, and many mountain streams. The water current and the complicated landform can make many waterfalls. In particular, Pinaisara Falls which is the highest one in Okinawa Prefecture and Mariyudu, Kanbire Falls which is located in Urauchi River are very well known. Mangrove forests develop at riversides around the estuaries, especially the mangrove along Nakama River basin is at the largest of those in Japan. Although it is not well known unexpectedly, a good quality of coal is produced from Iriomote Island, in former days, there were large-scale of coal mine shafts in Uchibanare Island, Urauchi River basin and so on. However, all of those have been abandoned according to reduce of demand, there can be still more deposits even in these days. Since there are soils of elevated corals called Ryukyu limestone at some part of the island, limestone caves develop in places. There are the only one hot spring of Okinawa in Iriomote Island. Because a volcanic range runs nearby, even a submarine volcano is located in northern 50km distance from the island. Accordingly, an earthquake occurs occasionally but not so frequently, once we had an unprecedented great tsunami at this area. Although population of people who have certificate of residence in the island is approximately 2000, it increases to about as two times as usual during the tourist season owing to the many tourists. According to Koppen's climate classification, Iriomote Island belongs to the humid temperate climate (Cfa). However, discriminative criterion between the temperate climate (C) and the tropical climate (A) is whether monthly average temperature of the coldest month is lower than 18 oC or not. In the case of Iriomote Island, however, as the average temperature of the coldest month of January is 17.6 oC, it is not excessive speaking that Iriomote is under "the tropical climate". Yearly average temperature of Iriomote Island is 23.3 oC, being warmer than Hong Kong where the average temperature is 22.8 oC. Thus, Iriomote is much warmer than the Japanese main islands especially in the winter, however, temperature in the midsummer does not differ very much from that in the Japanese main islands. It is not rare that daily maximum temperature of the Japanese main islands in the midsummer excesses 35 oC, but it is at most 32~33 oC in Iriomote, the maximum temperature tending to be lower. However, the temperature and the hotness are different, it is extremely hot in the midsummer of Iriomote. Strength of sunlight and quantity of ultraviolet rays must be as many times as those in the Japanese main islands. Therefore, enough preventive measures for the ultraviolet rays necessitates when walking outside and swimming in the sea, sunscreens and sunburn lotions should be necessary articles. Although some people may prefer to get a good suntan in Iriomote, suddenly exposing bare skin for the sunlight must be a suicidal act. I know some people who were sick in bed by extreme sunburn, getting blisters in their skin, also fever and dehydration. In order to get a beautiful suntan in Iriomote, you should have made foundational suntan in advance at a suntan saloon, or gradually make the suntan with a protection by the sunscreen. When snorkeling in the sea in the midsummer, I would recommend you to swim with a T-shirt. As for clothing, we can live with a T-shirt and a short pants during April to November because the daily maximum temperature excesses 20 oC. In the other seasons, it is enough with a sweat shirt and trousers, we never wear a thick sweater or a coat. Even in the winter, when sunny days the sunlight is rather strong and we feel hot. Since Iriomote Island is located at the center of the Black Current, sea water temperature is also high, it never falls below 20 oC. The yearly average sea water temperature is 25.3 oC, such a warm marine environment cultivates colorful corals, being a paradise for various tropical fishes and shellfishes. By the way, the water temperature when the start of the swimming season in the Japanese main islands is 22~23 oC, therefore we may be able to swim in the Iriomote throughout the year, however in the winter (December~February), as we feel cold after getting out of the sea because of a seasonal wind, actually it might not proper for swimming. Of course diving is available throughout the year, but it may be better for people who are sensitive to the cold to wear a dry suit. Nevertheless, we can tell how Iriomote is warmer when comparing the water temperature with that of the other places. But notice that many of the diving services in the island are closed since a few weeks after new year until the end of February because visiting guests are few at that period. We have large amount of precipitation in the Iriomote Island all over the year, the annual precipitation is as 1.6 times as that in Tokyo. Thus we always have abundant water, never falling in a drought. The landform with many mountains can make a rain cloud appear, always there being some squall cloud somewhere over the island and being raining. Even if it is fair sunny, suddenly a terribly dark cloud appears and a squall like water falls will come immediately. Such a phenomenon is too common to prove that the climate of Iriomote is able to be called as tropical. The spring rainy season is since the middle of May until the middle of June, every year. It is about one month earlier than that in the Japanese main islands, the rainy season in Iriomote is over in place of the beginning of that in the Japanese main islands because the seasonal rain front goes north. The humidity during the rainy season in Iriomote is 85~100%, as if we were in a steam bath. But the precipitation during the rainy season in Iriomote seems to be less than that in Okinawa Island. After the rainy season, the real summer comes. When immediately after the rainy season, the days with fair weather and no wind continues, it is the best season to feel a charm of Iriomote. After the middle of July, the typhoon season which is popular in Okinawa comes. About 3~5 typhoons attack or influence to Iriomote a year. The typhoons frequently appear in this season in waters from north of the Philippines to near Yaeyama. Features of the typhoons around this area are that generally they move slowly and they steadily develop in moving. For example, it is not rare that Iriomote Island has been in a strong wind area of the typhoon for 4~5 days. Power of the typhoons are also dreadful, houses are completely destroyed and concrete made telephone poles are broken at the root. Although sometimes people die or are injured owing to the typhoon in the Japanese main islands, it seldom happens in Okinawa. Because people never wander outside during the typhoon to realize a dread of the typhoon. When visiting Iriomote in the summer tourist season, some people may unfortunately encounter a typhoon and are shut up in a hotel for a long time. Then, you should give up with good grace and hope the next visit. In Okinawa, even if people lose their houses to live by the typhoon, all we can do is just to give up. During the typhoon in Kanpira-so, tourists are playing games such as cards all together and are thoroughly drinking at night. However, it may be pleasant because we can make friends with the other tourists who were shut up together. Since primitive nature is remained in Iriomote Island, some peculiar animals and plants inhabit there. In particular, Iriomote wild cat (Iriomote yamaneko) which is designated as a special protected animal is popular, Iriomote Island is well known as a "habitable island for wild cat". Although some people may imagine that the Iriomote wild cat wanders everywhere like an ownerless cat, it must not be true and we hardly can see it. Even myself who visited Iriomote more than 20 times have not seen it yet. Nevertheless, I have closely encountered it, that is, one night when I was running on a load-carrying platform of a truck, suddenly the driver stopped it and I heard that he had seen a wild cat at a stream along the road . But the wild cat had already disappeared when I got off from the platform and observed there. Estimated present existential individual number of the Iriomote wild cat is about 100, so we are making efforts to protect it. A traffic sign standing along road everywhere in Iriomote Island. 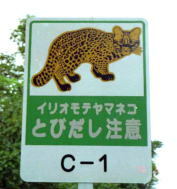 Not a small number of wild cats encounter traffic accident. Although once we had an extreme dispute to compare the importance between the life of people in the island and the protection of the wild cat, now the wild cat is recognizing as a valuable natural heritage. Not only for Iriomote wild cat, Iriomote Island is a paradise for various livings such as kanmuri-washi, semaru-hakogame, kishinoue-tokage, which are also designated as protected animals, and so on. I will explain on some animals and plants below to be referred. A relict of primitive cats, having cylindrical trunk and slender head comparing with a common cat. Its existence was recognized in 1965 and taxonomically described by Dr. Yoshinori Imaizumi in 1967. This species never exists in the earth except Iriomote Island. Although mainly nocturnal, sometimes it acts even in the day time. A special protected animal designated by the national government. 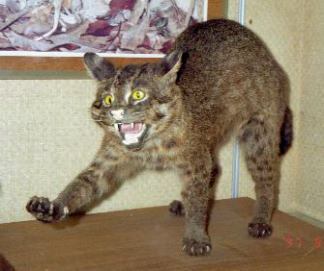 It is called "yamamaya" by hunters of Iriomote, and they have a rumor that a rather larger size of distinct wild cat called "yamapikarya" also exists in Iriomote. 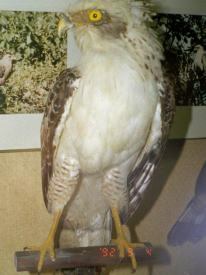 A smaller raptorial bird broadly distributed in southern Asia, in Japan it occurs only in Ishigaki and Iriomote Islands. It exactly propagates in Iriomote Island, indicating the northern limit of its distribution. "kanmuri" means a crown, thus it was named after an appearance like having a crown when it opens feathers on its occiput. We commonly see this bird in Iriomote Island, it is sometimes settling on a telephone pole, a branch of a tree and so on. A special protected animal designated by the national government. The largest lizard in Japan with total length of 40cm, being distributed only in Miyako and Yaeyama Islands. 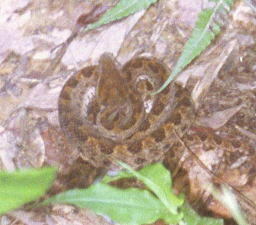 In Iriomote, it inhabits near human dwelling such as farming grounds and along the road. As it acts in the daytime, we can rather commonly see it everywhere. 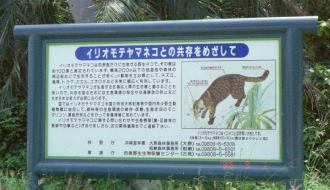 It can be an important prey for Iriomote wild cat. A protected animal designated by the national government. 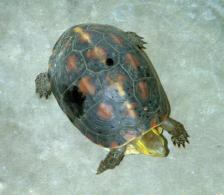 The only one terrestrial tortoise in Japan and never entering the water. It is distributed in Iriomote, Ishigaki, Taiwan and a part of China. Having a big feature that it can shut up its shell completely by abdominal plates like shells when pulling in its head, arms and legs unlike the other common tortoises. Further, it peculiarly has a round and swelled carapace. It is active in particular after rain, often wandering along the road by human dwelling. A protected animal designated by the national government. 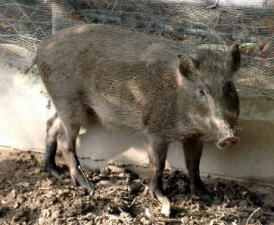 A subspecies of Japanese wild boar (nihon inoshishi) that is distributed in the Japanese main Islands, this subspecies grows up at most 60kg in body weight unlike the original species which reaches 150kg. Since it abundantly inhabits Iriomote Island, capture with a trap and so on is permitted. It is called "kaman (kamai)" in Iriomote, being valued as protein source for human because its meat is delicious. Four species of habus (Japanese poisonous snakes) are distributed in Ryukyu Islands and this species is peculiar to Yaeyama Islands. Although its poisonousness is weaker than that of habus in Okinawa and Amami Islands, it must be dangerous if a human is bitten by that. It commonly occurs around farming grounds and human dwellings, often appears in a sugar cane field. As it hates a light because it is mainly nocturnal, we have to take a flashlight when going out at night in Iriomote in order to avoid the habus. But its temperament is comparatively gentle, hardly attacking the human positively. A kind of lizard which is very commonly seen in the mountains of Iriomote, frequently climbing trees. Having a long tail, and a square head makes engaging looks. Because it acts agilely, it is difficult to catch by hands. Being distributed from Taiwan to Ryukyu Islands, contains of some subspecies. Although its body color is basically greenish or light brown, it often changes the body color. 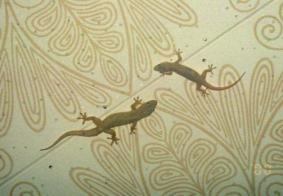 A kind of gecko which inhabits anywhere of houses in Iriomote, many individuals are often adhering to the ceiling. It catches and forages insects which gather to electric lights with an agile act. It is an useful animal to feed harmful insects such as mosquitoes and flies. When we are in a hotel at night, we hear a sound of "kot kot kot kot kot", that is originated from this gecko. This is not a kind of crabs but a huge hermit crab. It is broadly distributed in the islands of tropical Pacific with the northern limit of Yoron Island. It is hiding in Adan groves or rock pit in the daytime, getting out at night, sometimes wandering on a beach or road side. 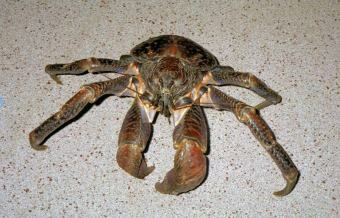 The power of its large claws (chelipeds) are quite strong, they can easily break a human finger caught by themselves. It is very delicious as food, its muscle tasting richly flavor, between a lobster and a crab. However, we have to be careful to eat because it can have a toxin called ciguatera by individual. A protected animal designated by the Okinawa prefectural government. This is a crab which adapts to terrestrial life, living its whole life on the land except larval stage and spawning season. The size is rather large, carapace width being 15cm and the total width when opening both of the chelipeds reaching 30cm. It is broadly distributed in islands of tropical Pacific southward from Amami Island and those of Indian Ocean. It is commonly seen at coastal regions of Iriomote Island, sometimes wandering on a road. Females which sit on eggs get into the sea and spawn all together around the summer full moon night. Also, it is edible. 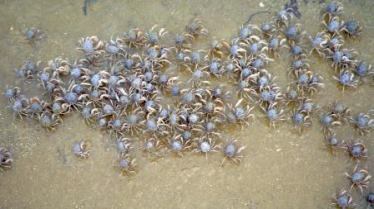 A small crab whose size is about 1cm in carapace length inhabited an estuary and a tidal flat of inland waters. Forming a large school of which contains several hundreds or thousands individuals, foraging a organic matter (detritus) in the sand. As they are very sensitive, when a human approaching, they sense it about 10m before and borrow into the sand. Having an interesting habit that borrowing into the sand in spinning. 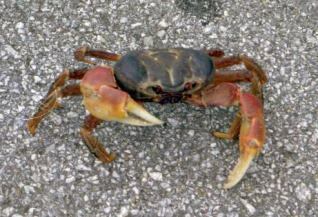 In Iriomote, it is called "heitai gani (soldier crab)". An evergreen tall tree growing in a damp ground somewhat upper from mangrove area. Its flowers come out in June~July, the color of the flower is white or light pink. The flowers come out only in the nighttime, they almost drop down until early morning. The sight that plenty of dropped flowers are flowing from the upper of a river is fantastic. 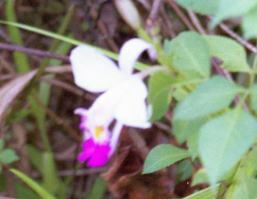 A wild orchid which has a beautiful flower similar to cattleya. In Japan, being distributed only in Ishigaki, Kohama and Iriomote Islands, in particular being abundant in Iriomote. Its Japanese name is after a place of Nariya that was once in Uchibanare Island which is one of adjacent islands to Iriomote. It grows in clusters at a sunny wilderness or foot of mountains, having a flower almost throughout the year. 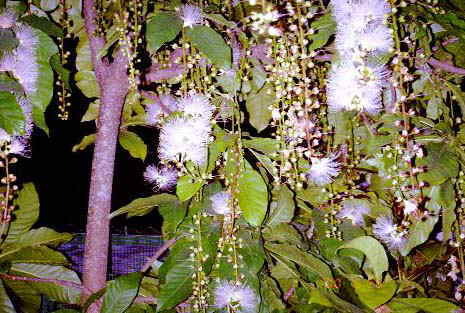 An evergreen tree that grows in banks along a beach or river sides of tropical islands. Since its leaf edge is serrate, it is painful when touching. Bearing a large fruit very similar to a pineapple, it is a favorite food for yashi gani. 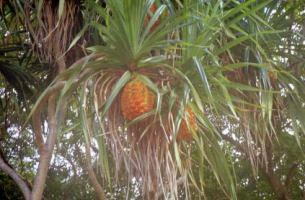 The fruit also can be edible, although some people criticize its flavor, unexpectedly tasting sweet and might being good. The dried leaves are utilized as a material for handcrafts such as a hat and a basket. 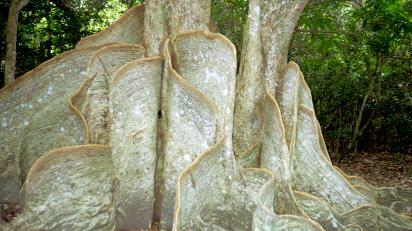 A tree that grows in a mangrove forest or adjoining low-lying damp ground, a corrugated sheet-like root expands from the trunk in every direction. This root is called "bankon (plate root)", in former days it was utilized as a rudder by cutting off. A large colony of this tree located at Maira River estuary in Komi is designated as a protected plant by the national government, however, it has been rather damaged by recent typhoons. A kind of ferns which is ephiphytic to a tree in the mountains or a damp rock, being a evergreen perennial plant. 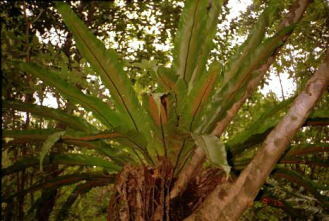 Slender leaves expand radially, sometimes reaching 2m long. 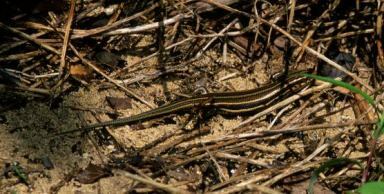 It is seen everywhere in the jungle of Iriomote, often dropping down to the ground after a typhoon. Its sprout is edible, being delicious as dishes of deep fried one and that with Japanese dressing. Although it is uncertain when people began to live in Iriomote Island, Iriomote first appears in an ancient document published in Korea at 15th century. Even in the days before that, there is an evidence of human life suggested from traces of disposition of a dead body by exposing it to the elements. However, nevertheless Iriomote is a big island, the fact that there is a little ground suitable for living and an endemic disease of malaria have not permitted the people to settle. Although now we have a specific remedy for malaria, in former days it was an extremely terrible disease, not a small number of villages repeated to perish owing to the malaria. However, Iriomote is a land very suitable for rice farming because there is abundant water, so people of adjoining Aragusuku and Hatoma Islands expressly came there to farm. That was just the way they could, because they could not settle there due to a dread of the malaria. After the World War 2, it is supposed that the malaria has been eradicated from Iriomote, at last it can be a place where we can live in peace. Now existent villages in Iriomote Island are, ranging along the circumference road from the south, Toyohara, Ohara, Otomi, Komi, Mihara, Funaura, Uehara, Nakano, Sumiyoshi, Urauchi, Hoshitate, Sonai and Shirahama, there the road ends, however more ahead, there are villages of Funauki and Amitori. In these villages, the area from Toyohara to Mihara is called eastern region and westward (northward) from those are generally called western region. Once there was not a road to connect the eastern and the western regions, therefore the traffic depended on a boat nevertheless within an island, at last the two regions are connected with the northern coastal road which was opened in 1977. The oldest village in Iriomote is Sonai, which is considered to continue to exist at least since 14th century to the present time. Also Komi in the eastern region is regarded to be established at the oldest age of Iriomote, however, it repeated to perish because of the malaria in question, the present village is established by newly immigrated people after the World War 2. Further, some villages such as Otomi and Sumiyoshi were established by a systematic immigration. Thus, most of the present villages in Iriomote can be regarded to be comparatively new except a few ones. Uehara where our Kanpira-so is located is the village with the most population in Iriomote. Although it once perished at the beginning of 20th century, thereafter people immigrated from Hatoma Island and everywhere in Okinawa, now showing the most prosperity in Iriomote. Considering the culture of Ryukyu Islands in the prehistoric age from archaeology, Okinawa Island with its adjacent islands and Sakishima Islands including Iriomote formed totally different cultural spheres each other, Sakishima Islands were common to southern cultural spheres of the Philippines and Polynesia. However, it was gradually integrated into the Okinawan culture owing to prosperity of Ryukyu Kingdom originated from Okinawa Island. As earlier mentioned, very few villages in Iriomote continue to exist from the ancient time, therefore what is called traditional culture from the ancient age does not remain very much. But in some villages, which exceptionally have a long history, such as Sonai and Hoshitate, important traditional events such as "shichi" and "honensai" are held every year by all of the village people. It is considered that such traditional events once existed in every village, it was handed down from some elderly people who once lived in Sakiyama and Amitori which have perished comparatively recently. The language spoken in Ryukyu Islands extremely differs from that in Japanese main Islands. The language of Okinawa is sometimes called Okinawan dialect (especially in Okinawa itself), however, it differs from the Japanese language not only in words but also in conjugation of verbs and adjectives, thus it further excesses the dialect level. For example, they can be different at over the levels between Spanish and Portuguese, and between Malay and Indonesian. It can be natural because there used to be a "distinct country" called Ryukyu Kingdom in Okinawa. Thus, hereafter the language of Okinawa is expressed as "Okinawan". In Okinawan, language spoken in Okinawa Island and its adjacent islands and that spoken in Miyako and Yaeyama Islands (Sakishima Islands) seem to differ from each other very much. But for common Japanese people who live in the Japanese main Islands, they cannot distinguish their differentiation because they do not understand both of the languages at all. I have ever talked with a man who came from Okinawa Island to work as a laborer and was staying in Kanpira-so for a long time, then he said "I don't understand the language in Yaeyama at all.". However he also said that he generally understood the languages in Amami and Okinoerabu Islands. Since Ryukyu Kingdom expanded its sphere of influence to Amami Island in its heyday, Amami, Okinoerabu and Yoron Islands were completely in the Okinawan cultural sphere, so languages can be similar one another. In contrast, the language in Yaeyama is preserving its peculiarity even after Yaeyama was integrated with Ryukyu Kingdom as Yaeyama once belonged to the different cultural sphere from Okinawa. However, people who can speak pure native language of the island are undoubtedly rapidly reducing, actually people in young generation hardly can understand such a traditional language. People in Iriomote Island of course well understand the standard Japanese language, therefore if a foreign tourist can speak Japanese, the common Japanese is available, also some broken English might be understood in some cases. Iriomote Island belongs to Taketomi-cho (cho means an administrative town), Yaeyama-gun, Okinawa Prefecture, of course it is the largest island in Taketomi-cho. Administrative Taketomi includes very wide area, all of the islands in Yaeyama except Ishigaki and Yonaguni Islands belong to the Taketomi-cho. Because all of the islands in Yaeyama excluding Ishigaki and Yonaguni which are united culturally and populationally are combined into a single administrative town, and the name of Taketomi Island where once a government office of Ryukyu Kingdom to reign over Yaeyama was placed was taken for the administrative name. Therefore you may imagine that Taketomi town office is located in Taketomi Island, however actually it is not, the town office is surprisingly located in Ishigaki Island. It is by a reason that Ishigaki is convenient in traffic and transportation from any islands in Taketomi-cho (every sea route to the other island starts from Ishigaki), it is a very interesting administrative system. They say that Ohara in Iriomote is regarded as a likely candidate place for moving of Taketomi town office in the future. In Iriomote Island, there are substations of Yaeyama Police at Ohara, Funaura and Shirahama, a single policeman is residing each. Although we sometimes see some of them patrolling by police car around the island, we hardly see them rushing to the scene in sounding a siren. So far as I know, it was only when a boat of Vietnamese refugees was washed up to Uehara and when an accident happened during a diving at Barasu Island. It suggests how peaceful Iriomote is, on the other hand, there are very few causes of cases and accidents according to a little population. In October, 2000, a case of murder happened in Hateruma Island and it was exaggeratedly reported by mass media. I guess perhaps it is the first event in the history of Yaeyama. Although such a kind of case is quite common everywhere in the Japanese main islands, it greatly surprised the people as it happened at an unlikely place. Except Ishigaki that is rather urbanized, I have hardly heard of any crimes even a theft in the islands in Yaeyama. If a person commits such a criminal act, he will not live there any longer. It is as same as in Iriomote. I stay at Kanpira-so every time in Iriomote, always leaving my valuables such as cash in my room and have not locked it up. Of course I would never recommend you to do that, but it suggests the safety of Iriomote. Such a place may be a dream land comparing with the other places in the world. However, as the late case in Hateruma symbolizes, for example once a wanted man was arrested in Ishigaki Island, it might be true that the recent situation of Yaeyama is changing worse. Since there is not an airport in Iriomote Island, we access to the island by sea routes from Ishigaki Island. Entrances from the sea to the island are, Ohara Port in the eastern region and Funaura or Uehara Ports in the western region. We have many sails of rapid boat and ferry boat to commute every day, they are transporting tourists and goods. There is only one trunk road in the island, which is the coastal circumference road connected Toyohara in southeastern part with Shirahama in northwestern part, there are no roads which run in all directions unlike the other islands. In Addition to that, there are some small roads for life and farming at every village. The circumference road is fairly maintained. Once construction of a crossing road of the island was planned and it had started partly, however, it was given up in order to preserve the nature. The traces of that plan is Otomi Forest Path and Shirahama Forest Path. At Ohara, there used to be only one crossing with a signal in the island, but that was made also at Nakano some years ago, the traffic signal in Iriomote has surprisingly become to be two. There are no no-parking areas in the island, also no traffic jams because cars are not so many. The traffic methods for sightseeing depends on a bus on a regular route, a taxi, a rental car and a rental motorcycle, but the route bus is not very useful because its run times are very few. Although the rental car is useful when making sightseeing by some people, you should be careful not to fall into no fuel as there are only 3 gas stations at Ohara, Uehara and Hoshitate. By the way, the gasoline is expensive in Iriomote. Maybe it cannot be avoided because there is no competition among the gas stations. Since there are no banks in the island, a cash card for the bank or any kinds of credit cards are not available. However, there are post offices at Sonai and Ohara and the cash card for postal savings is available there, so it is convenient to take it if you have that. Although there are no convenience stores, there are grocery stores or supermarkets in the main villages, thus we can get general necessities for our life. Near Kanpira-so, a big (so far as in Iriomote) supermarket of Kawamitsu stands cater-corner across the street, being convenient to get foods, liquors and so on. Although there are no hospitals, there are medical offices of Yaeyama Hospital at Sonai and Otomi, a doctor and a nurse are residing respectively. I hear that they can treat for general diseases except about teeth. As for a cellular phone, companies of NTT Docomo, Cellular and AU are available, but PHS (personal handyphone system) is unavailable. There is no gray public telephone for the Internet. Several common public telephones are placed in every village but no more in any other places, it cannot be convenient. Goods are transported mainly by the mail, recently the home delivery service is gradually popularizing. It is convenient for you to send a large baggage such as diving gear to the hotel in advance. In case of the mail, you should be careful for a weight limitation of 20kg. A car or a motorcycle can be transported from Ishigaki Island to Iriomote Island by a cargo ferry of An-ei Kanko called "Paikaji", and that of Yaeyama Kanko Ferry called "Kariyushi" or "Heiseimaru".